Expense Manangement is intended to track expenses incurred by your employees. Once expenses are entered, the purpose of this tool is to approve, correct, and to create defaults used by your defined approval process, including defining what is reimbursable and its payment method. Your managers will typically enter their expenses and those of the employees which report to them. You have the option of creating an approval process which you design yourself. Authorized approvers then review, correct, approve, or reject the expense transactions. Accounts payable (AP) invoices are generated so employees are reimbursed for expenses they incur. Employee Maintenance, Site Configuration Control, and Pay Method Maintenance are some of the programs you use to set up the expense entry and approval processes. Project Management is used primarily but not exclusively to manage the manufacturing of large capital projects. To organize these projects you use Work Breakdown Structure (WBS) Phases or project Milestones. With WBS, you create parent and child phases for your projects. Each phase can have multiple jobs assigned to them. With Milestones, you will need to defined specific completion points within your projects. In addition, you will create quotes, sales orders, and purchase orders which will be required to finish the project. These processes will enable you to track the costs associated with each phase of the project as well as the total cost for the project. You have the flexibility to create non-manufacturing projects, like project invoicing. These type projects can be billed through a variety of methods, like, progress billing, cost plus invoicing, or time and materials invoicing. A power feature of Epicor Project Management is your ability to export a project to Microsoft® Office Project 2010® and 2013®. Within MS Project, you can modify the project as needed and then import the project back into Epicor. Maintenance Management enable you to enter maintenance requests, track maintenance jobs, and to plan preventative maintenance on your plant equipment. This includes but is not limited to: capital equipment, tools, gauges, and fixtures such as air conditioning units, forklifts, and shop floor tools. Maintenance jobs can be entered directly by your outside service provider or in-house personnel. These jobs can be planned in advanced and scheduled based on a variety of factors. Please do not use this modules for managing or scheduling maintenance you perform of parts or equipment you have sold to your customers. Field Service is intended to manage the installation, repair, and service of parts in the field or at their facilities. 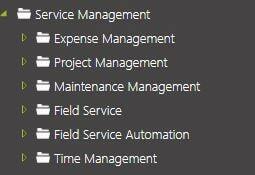 You use the Field Service module to assign personnel and schedule their service calls. It is through Field Service you can determine if the customer problem is still covered by your warranty and whether it is billable of not. The Service Call Center centralizes the processing the dispatching of technicians and the reporting of costs associated with field services. When field services are performed by field personnel, labor cost can be recorded. Depending on your warranty or field service contract, these costs will be billed against the contract or invoiced to the customer. With Epicor’s new Mobile Field Service app, your field technicians have real-time access to pricing and inventory availability. They can also use this app to process service calls, report labor costs, inventory and materials used, and update field service jobs real-time. Time Management is used to enter and to manage your employees direct and indirect labor hours. Their supervisors are able to approve, and correct time transactions. You will be able to set defaults used in the time approval process. Typically, employees enter their labor hours on a daily or weekly basis and then submit their hours for approval. Authorized approvers then review, correct, approve, or reject the time transactions. Reports are available to generate employee timesheets and to help manage employee work hours and percentage utilization.